Tukwila Opts for Rental Licensing/Inspections- and Bellingham? The city of Tukwila opted in a 7-0 council vote (click here) on 19 April to begin a rental licensing and inspection program for the 4,000 rental units within the municipality. The program is scheduled to take effect on 1 January 2011. Some of the prior discussion of the licensing law can be found by clicking here. Tukwila joins Pasco, Prosser, and Seattle; Washington cities that have adopted licensing and inspection laws. Tukwila is undergoing the same financial pressures as other cities in Washington State. Their City Council minutes are replete with references to and discussions of fiscal problems (click here to read some council minutes) yet they have found the courage to do the right thing in the realm of health and safety for the thousands of home and apartment renters there. This blogger spoke to Tukwila's code enforcement officer yesterday at length. She indicated that this was the culmination of over 10 years of effort to clean up the dilapidated rentals in Tukwila. With some imagination, the City of Bellingham can do the same. There continues to be a refrain from some members of the council that they have not heard enough to discern a genuine need for inspections of rentals here. Let me summarize the rationale for licensing and inspections and lay that thought to rest. The council has already heard from several neighborhoods that support rental licensing and inspections to include Samish, on whose board (for the record) I serve. I am aware that you have received similar letters from the York and Sunnyland Neighborhoods. On 17 March, the Mayor’s Neighborhood Advisory Commission (MNAC) recommended that “a rental housing licensing and inspection ordinance be drawn up for review and discussion in 2010 in a public process." This recommendation was approved by an overwhelming vote by neighborhood representatives that implies some support for the concept of rental licensing and inspection. With respect to Pasco, there is a successful program in place there that can serve as an example for us. Both cities have to contend with transient populations (in spite of Mayor Pike’s incorrect assertions to the contrary). We have thousands and thousands of highly mobile students and Pasco has migrant workers. Mitch Nickolds, their code enforcement officer, has told me and I have relayed this to Mark Gardner, the Council’s Legislative Policy Analyst, and to Council President Gene Knutson back in February, that he (Mr. Nickolds) would be pleased to come to Bellingham to present their program. Instead the council gets a second hand briefing on Sacramento, CA and its experience, Sacramento being nothing like Bellingham in size or in rental situation. NB. We also get oblique comments during a 24 May committee meeting from Tim Stewart and Mayor Pike implying vaguely that Auburn had tried licensing/inspections of some sort but that they had not worked out especially in single family areas. There is not now nor has there ever been a rental inspection program in Auburn. I talked to several people in their planning department who indicated that they have rental licensing only ($50 a license). Embedded in their licensing code is language pertaining to continuing criminal or nuisance activities within rental units (to which Stewart and the Mayor seem to have been actually referring) and that is the issue for which Auburn will take action against a landlord. 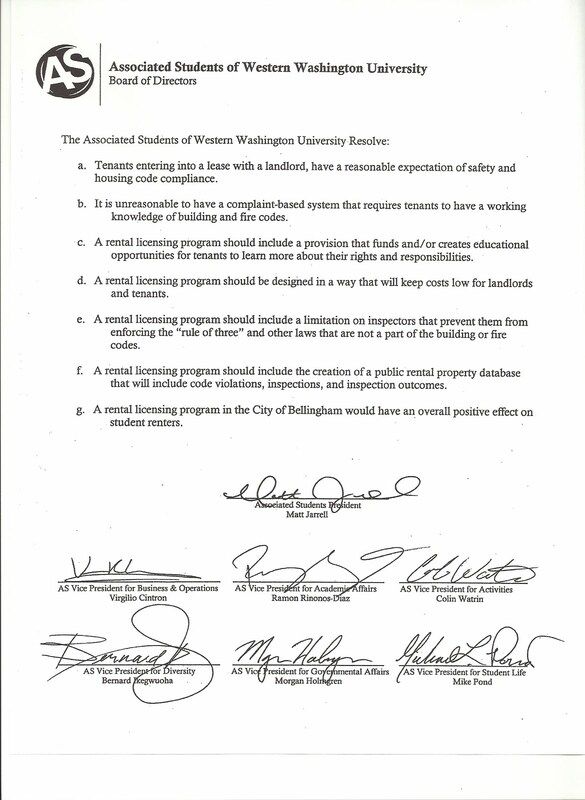 To compare the licensing program in Auburn or to suggest that there is some similarity to that which we are discussing in Bellingham is disingenuous. Even their licensing application contains the phrase: “The issuance of this business license does not imply compliance with the Zoning Code and International Fire and Building Codes.” The Auburn code portion (Title 5, Chapter 5.22) on rental licensing is available to read by clicking here. No self-certifications, no mandatory safety/health inspections, nada, zilch, zero. The Mayor claims that he has not been convinced of the sustainability of such a licensing program although the study from Mark Gardner, that appeared over 18 months ago, has ample data that a modest annual fee per unit would provide nearly a half million dollars per year. It is difficult to fathom the reason for which such monies would not finance a fairly robust inspection regime. Program costs would eventually decrease as rental units are brought into compliance and the rate of inspections naturally slows. The Mayor also attempts to dissuade and distract the council by saying that the push for licensing comes from a few disgruntled people whose true aim is to ensure the enforcement of single family zoning codes. This is a red herring argument, one which I have repeatedly dismissed (read my blog entry on this topic here) even as I am a member of the so-called “disgruntled”. The code on illegal rooming houses must be dealt with but within its own context. I urge the council to take up this issue in a separate venue for the purpose of decriminalizing violations and ensuring the inclusion of Washington statutes on domestic partnerships in our code. Additionally, Mayor Pike’s unfortunate and continued reference to the “unconstitutionality” of the single family zoning code injects a dollop of doubt into the argument that is not supported by case law, to include a Supreme Court decision in 1974. Mayor Pike’s own City Attorney prepared an agenda item several years ago in which this bugaboo of “unconstitutionality” was definitively debunked. You can read that agenda item (Agenda Bill 18021) by clicking here. The Mayor also suggested that there are more imposing priorities (than health and safety?) without actually outlining them. Big Box stores or maybe the Waterfront? Were these priorities enumerated, we might have a rational discussion, however, briefly plopping the suggestion on the table (as one would a dead skunk) that other problems are more pressing is not helpful to the debate and suggest a lack of awareness of those issues of importance to the neighborhoods (I refer to the MNAC recommendation mentioned above.). I also note that the City Council’s own document on Legacies and Strategic Commitments to “future generations” indicates that it wishes to “support safe, affordable housing.” If not an inspection program, what does the council propose to ensure this housing safety? Self-certification? That is no more than the status quo, gussied up by making a roster of landlords who will continue to operate as usual. Any program relying on self-certification is not worth pursuing unless it is based on and preceded by a mandatory inspection of registered units. Without an initial mandatory inspection, there is no guarantee of safe housing. Worse yet is our complaint-driven system of code enforcement that is, unfortunately, still the national norm and remains our default arrangement. Such systems simply do not work. Complaint-driven systems protect neither renters nor the buildings in which they live. The Centers for Disease Control concluded in a study of these systems that renters do not complain. In the absence of complaints, problems fester. As problems fester, buildings deteriorate and become more dangerous. As buildings decay, they take neighborhoods down with them. The remainder is called a slum. And now we hear from the students who have finally realized that for decades the rental market here has not operated with their well being in mind. You have seen the Associated Students resolution (read a copy of the ASWWU resolution by clicking here.) and the various articles and editorials recently in the Western Front. (Click here and here) Any further debate on the rental licensing issue should include student input, especially during any hearing, and should therefore be postponed until the students return in Sept/Oct. 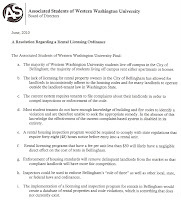 The Associated Students of Western Washington has just published a resolution supporting rental licensing and inspections in Bellingham. You can read about the Associated Students by clicking here. Copies of the resolution can be seen by clicking on the images at left. This blogger had encouraged students to support rental licensing and inspe ctions during several meetings that he attended on campus. Horror stories of sub-standard housing emerged during these discussions. The Zonemaven also encouraged the student body to make its voice heard through an open letter which was published in this blog on February 2nd. You can read that letter by clicking here. Student editorials in the Western Front also took a hard look at rental licensing. You can read about these editorials by clicking here. An article on rental licensing by WWU student Katherine Garvey appeared today in the Western Front. Here is a link to that article. Over 8,000 student renters on the market each year can have a tremendous effect on the manner in which the rentals are run. Shady practices and slum-like, dangerous conditions are issues that they will be looking at in the coming months since they occupy almost half of the 17,000 rentals in this city. Students are now getting a sense of the power their numbers command. In a 7-0 vote, the Seattle City Council (with two members abstaining) approved a law to license and inspect rental properties. You can read about the Council's actions by clicking here for the Seattle Times article on the subject. As with Prosser, WA, Seattle sought to approve a statute prior to the 10 June 2010 effective date of a Washington State law on rental licensing. Seattle, Pasco and Prosser will now be grandfathered and will not be subject to the limits of the legislation passed in Olympia in March. Unless Bellingham takes action to pass a rental licensing and inspection code prior to 10 June, it will fall under the restrictions of Bill 6459 - An Act Relating to the Inspection of Rental Properties. Hesitation not being part of the Prosser, WA City Council agenda, the town quickly adopted a rental licensing and inspection program on 26 May. The new law will take effect on 1 January 2011. You can read an article in the TriCity Herald on the topic by clicking here. Essentially, the City Council decided to pass a place-holder law to avoid the restrictions placed on rental licensing by the Washington legislature's Bill 6459 (click here to read about that statute) which allows rental licensing and inspection codes passed before 10 June 2010 to be exempt from the new state law. The town of Pasco already has a code in place that will also be grandfathered under the bill passed in Olympia last March. You can read Pasco's rental licensing code by clicking here and scrolling to Title 5, Business Licenses and Regulations on page 106. Prosser essentially borrowed the wording of the Pasco ordinance while planning to amend it at a later date to conform to the local situation. Seattle is also now considering a licensing and inspection law. There, an officer with the Associated Students of the University of Washington testified before the City Council in support of inspections of rentals echoing the stance of the Editorial Board of the Western Front student newspaper of WWU. (Click here to read about the Western Front editorial) The program in Seattle would pay for itself under a fee charged to landlords. You can read an article on the Seattle licensing debate by clicking here. 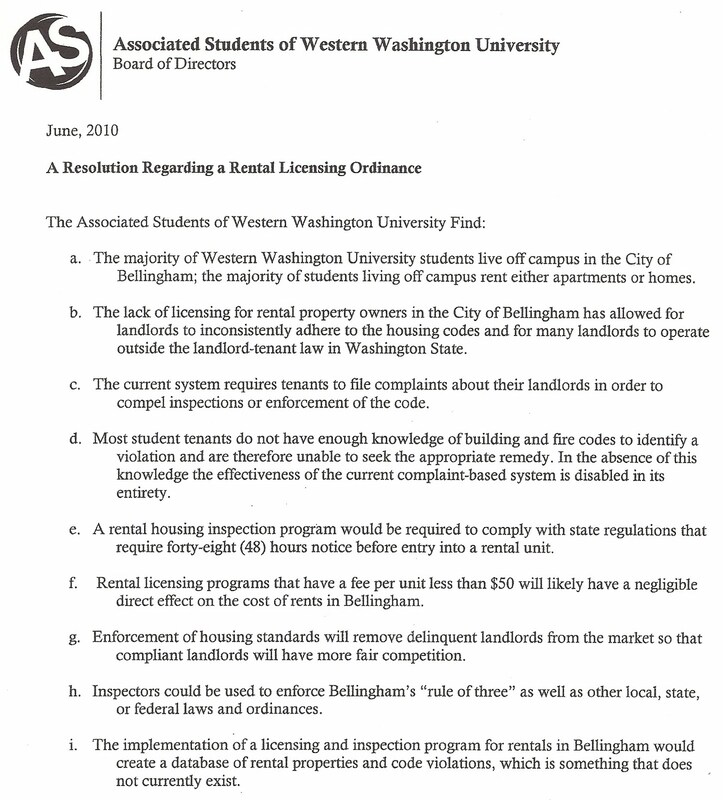 It appears, then, that Bellingham is not alone in its pursuit of ensuring the safety and health of renters. Our Mayor and City Council should take note.